Brian retired from the University of Guelph (Veterinary Medicine) in Ontario, Canada in and relocated with his wife to British Colombia. 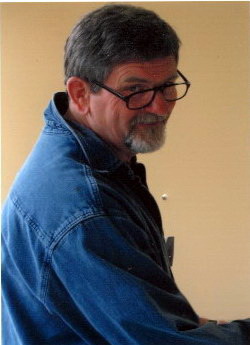 He has won numerous competitions and awards for both his studio and plein air paintings and is represented by galleries on Vancouver Island, in Alberta and Ontario. I retired to Vancouver Island in 2001. In 2003, my wife signed me up for a Painting on the Right Side of the Brain course -- for my 60th birthday. I was fascinated by it, so I took a local acrylic painting course and was hooked. I painted for a year and read as much as I could, then decided I needed more basic knowledge. I took Barry Raybould's Virtual Art Academy course and found it brought structure to the learning of what to me (with a background in science) seemed to be a very unstructured and confusing discipline to grasp. That made me want more, so I went on-line and organized a series of artists that I wanted to spend time with and spent the next few years travelling in Canada and the U.S., taking workshops. Finally, I decided that I needed serious instruction and continuity in my learning, so I spent six months at the Jeffrey Watts Atelier in Encinitas where I painted and drew from life: portrait, figure, still life and plein air. They completely broke me down, then started to rebuild me. Since then, I've averaged two workshops per year and continue to develop on my own. No real stops and starts, but I developed prostate cancer prior to attending Watts. That set me back in some respects, but also made me more intent on learning what I could while I could -- not knowing the outcome. It was then that I decided that this was what I was going to do. I started with acrylics and it is my main medium today. I like the immediacy of response to changes. I am a "what if" painter and am constantly making changes and changing again. With acrylics, I get that instant feedback. As a result, they have given me the confidence to take risks and explore new approaches in my work. I particularly like using them for large pieces where I wield big brushes and get quite animated. But I also enjoy oils (I work in water soluble), particularly the small pieces -- both studio and plein air. I spent the last six months working mainly in oils to try to loosen up my approach with them and take the artistic risks I am comfortable taking using acrylics. That was my interest in taking Carol Marine's workshop last month and my reason for joining Daily Paintworks -- to see if I could find interest in these small experimental pieces. Joining DPW created issues with some of my galleries, but we worked out an understanding that I would only display the small pieces -- for which there is little or no return after framing and gallery commissions. Even in your darker, moodier work, the quality of light is wonderful. Can you describe your approach to capturing accurate brights and darks? I have been taught to consider values first and foremost to make a painting interesting and attractive. I spend time planning each piece -- studio or plein air -- doing small value sketches and trying to create interesting patterns. For my acrylics, I normally create a value under-painting. After placing the drawing, I apply a dark transparent acrylic with medium/water and use rubber shapers to remove according to value, leaving a three value pattern. Doing so gives me a chance to consider my large shapes in advance and make early changes. I also do a lot of down-glazing with dark transparents as the painting progresses, to even out values and create a bit of a mother colour, then bring back the lights with opaques. Examples of this approach can be seen on my blog. I don't have a problem with procrastination. I love the challenge of making paintings. My goal this year is to paint less, to try to bring more balance to my life. My day starts early and I have found that once I start painting, I am lost. So I have started my day by doing little things I need to do for a hour or so (DPW, blogs, emails, Facebook, etc.) before I get into the painting. Then I force myself to stop about noon, go for a workout or bike ride, then do other things (many art- related) for the rest of the day. So I'm trying to hold my painting to about 5-6 hrs per day of actual brush-in-hand time, 5-6 days per week. I live in (and next to) a beautiful and interesting country. We travel in our RV for 3 or 4 months each year from which I gather reference photos and do plein air sketches. I am constantly seeing sites that excite me and cause me to wonder, "Could I or how would I paint that?" Even faces excite my interest. There is still so much to learn that I don't feel the pressure of burnout. I also have a wife that gives me her full support and encouragement -- and that is essential as I am not pressured to do other things. Being in my late sixties probably makes my perspective different than someone younger or who must paint for a living. I so appreciate having found this passion at this stage of life that every day is an adventure. I also have had the good fortune to be able to sell my work from early on and that keeps me moving forward -- believing that each painting should be better than the last. I continue to take workshops. I love being with artists more experienced and skilled than I. Most workshops bring that. The other thing that has been wonderful is teaching. I do a five-day Fundamentals for Landscape Painters and a two-day Preparing for Plein Air workshop. Teaching forces me to keep current and makes it necessary to constantly review. The best way to learn something is to teach it. The past six months have been quite interesting. I made the plunge into on-line marketing and exposure to see what would happen: web sales, DPW, Facebook, blog, etc. It has taken me from my little town on Vancouver Island to interacting with artists and buyers all over the continent and into Europe. I just keep doing my "thing," but now the audience is expanding around me. So my most recent learning has been around strategies for marketing my product. As I grow as an artist I am constantly challenging myself to try new approaches. My work is becoming more impressionistic -- even abstracting my subject matter. It's that freedom to play and experiment that I like most, but also the fact that as my work grows in that direction, I am finding more commercial interest in it. A wonderful win-win! I like how your work has become more abstract, more colourful and more 'Fun'. I love your work Brian! It shows that you are having fun with color and design. I live in California and paint outdoors in both acrylic and oil, even watercolor. I like changing from one medium to another to keep my mind and eye seeing well, the work fresh. I like each medium for different reasons. Keep up the great work -- do you ever teach in California? Thanks for sharing! I love your work, too, Brian, and I think your attitude as a lot to do with how successful you are. It seems you are keeping the joy in painting! I wish you every success!